...Paper Crafting Therapy for You! 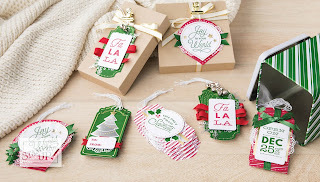 The Sincerely Santa Project Kit is so perfect for those who want a fancy, homemade tag for their perfectly wrapped gifts but don’t have time to start from scratch. The kit comes with several precut, patterned and foil tag pieces. Plus you’ll also receive self-adhesive stars, foil snowflakes, Jingle Bells, doilies and two different ribbons. One of the best features of this kit, in my opinion, is the tin you receive to keep all your completed tags in. To add those cute sayings to your tags you will need to purchase the Sincerely Santa Clear-Mount Stamp Set. Additionally, you will need Garden Green and Cherry Cobbler classic inkpads, scissors, Stampin’ Dimensionals, and adhesive. For step-by-step instructions you can either refer to the instruction handout in your kit or you can watch the Stampin’ Up! instruction video here https://youtu.be/eEJbUNt0KXw starting at 1:36. Of course if you are someone that follows the beat of your own drum you can totally create these tags using your own techniques. That’s the beauty of DIY. I just can’t wait to add these fun tags to all my Christmas gifts under the tree this year. Share your tag ideas using this kit in the comments below. Thank you for leaving a comment. I will review and publish your comment within 24 hours. If you choose to leave a comment anonymously without a name or email I will not publish it. If I am unable to successfully contact you in response to your comment, it will not be published. The content of this blog is my sole responsibility as an independent Stampin' Up! demonstrator. The use, content, & the classes offered on this blog is not endorsed by Stampin' Up!